So, I'm sitting here writing a sermon, when I chance to look at my Facebook wall—which can be a really bad idea, especially during times of global distress. Nevertheless, all the noise on social media got me to thinking. The sermon I'm writing is from this Sunday's lectionary reading from John. It's the story of Jesus standing in front of Pilate, being asked if he is indeed the King of the Jews. Jesus responds to this interrogation by saying, "My kingdom is not from this world. If my kingdom were from this world, my followers would be fighting to keep me from here" (John 18:36). And Jesus, who is about to be killed by the state out of fear, is right. Only, we tend to think that "my kingdom is not from this world" is a reference to some celestial dominion, far removed from the world in which we live. And immediately, people's eyes glaze over as they think of streets of gold. "My kingdom is not from this world," Jesus says. So, where is Jesus' kingdom from? We've tended to think of Jesus' response as a reference to a different place, as an answer to the question "where?" Out there, where the roll is called up yonder. In the sweet by and by. "This world is not my home, I'm just a passin' through . . . "
But I remain more and more convinced that Jesus' mention of a "kingdom not from this world" isn't a spatial question, a question of "where?" I think the appropriate question to pose to Jesus' claim of a "kingdom not from this world" isn't "where?" but "what? "—more specifically, "what kind?" The kingdom to which Jesus refers is from a different world, not in terms of spatial location, but in terms of quality and character. 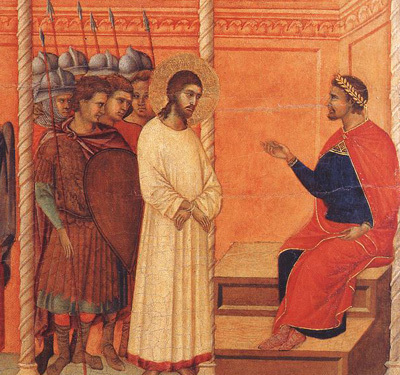 Pontius Pilate deals with Jesus from fear, as a threat. And how do we deal with threats in this world? We isolate them, dehumanize them. We stick them in ghettos, put them in prisons, sequester them in internment camps. But for God's sake, keep them away from us. And if none of those things work, we invest in ever more ingenious ways to kill them. But Jesus doesn't deal with others first as threats to be feared; he embraces them as sisters and brothers created and loved by God, and therefore, deserving of our profoundest attempts at love and welcome. So, when Jesus says his "kingdom is not from this world," he ain't kidding. The kind of realm over which Jesus reigns appears unintelligible to a world that believes threats are to be eliminated (by violence if necessary). Any kingdom that takes as its guiding principle the need to "love your enemies and pray for those who persecute you" is bound to appear alien to this world. Following Jesus is risky. Indeed, his "kingdom is not from this world"—a world in which fear of the "other" drives us to deal with threats in deadly earnestness. Consequently, the domain his followers serve isn't "from this world" either. So, if you want to follow Jesus, risk is what you signed up for. Syrian refugees. Muslims. Transgender people. If you're afraid, that's fine. Fear is something that just is. But if you're going to follow Jesus you're going to have to learn how to be faithful in the face of your fears. You're going to have to learn how to love those whom you don't understand, those whom you fear—not as abstractions, not as categories, not as threats—but as individuals, as human faces, as children of God. Fear and violence cannot define our relationship to those who are different from us, in the same way that fear and violence cannot define Jesus' "kingdom that is not from this world." I don't make the rules. I'm just telling you that if you call yourself by the name of Christ, there are some.